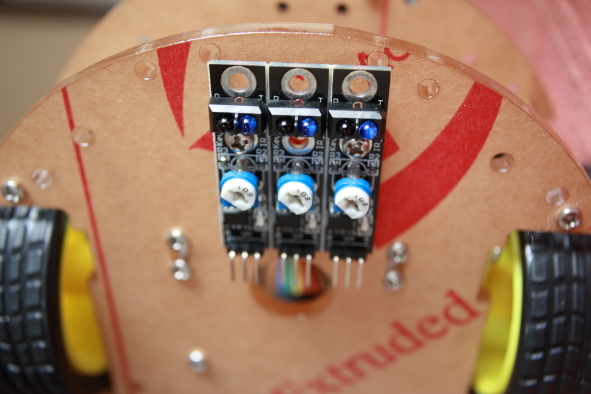 The Robot kit I’m building comes with three IR line tracking sensor modules. As with the other components, documentation is only available on the web. I have not found a source of information about how to use the sensors but it doesn’t seem to be that complicated. The sensor has IR light emitter and detector. The sensor returns the status of the IR light reflected from a surface as ON or OFF. The status of the sensor is shown by the LED. The sensor needs to be calibrated to set the threshold between light and dark. I managed to make the robot follow a curved line using only two sensors suing the sketch below. A complete line following solution will require all three sensors. I stand corrected. One sensor is not enough. I thought that the sensor returns an analog value that represents the light level, but these sensors return ON/OFF status. I managed to make the robot work with two in a limited way (see update). I think one is not enough for a “path system”. You need all the three attached modules because when your Robot losts the path, you need to know if you’ll have to turn on the left or on the right. Actually one is enough. The kit comes with three attached modules and I couldn’t take them apart yet, so I just attached the three to the bottom but only one is connected. Why 3 modules so ? Can we make a better “path system” than a simple line with 3 modules ?